In December of last year, Japan published its third National Defense Program Guidelines (NDPG). These guidelines, written under the supervision of the five-year-old National Security Council Staff, provide guidance for the development of Japan’s defense capability for the next decade. Earlier this month Sasakawa USA held a conference on these guidelines (a video of the conference is on our website), and the consensus of the Japanese and American expert participants was that the guidelines were a glass both half full and half empty. Even though they establish security policy for ten years, the guidelines do not set definite deadlines to achieve important joint operational capabilities. By 2029 the Japan Self Defense Forces must be capable of operating in multi-Service task forces under joint doctrine, with interoperable command, control and communications systems, with trained headquarters staffs and operational units skilled in operating with those from other services. The armed forces of many other countries grow weary of American adjurations concerning jointness, and sometimes dismiss them as mindless dogma. On the contrary, joint operations are a means to achieve greater military effectiveness from individual service capabilities when they operate in the same battle space. Integrated joint forces are the only way to combine the firepower of individual army, navy, and air force elements at crucial times and places across the entire battlespace. Forces without joint doctrine, training, communications, and attitude must play the equivalent of a zone defense in football or basketball and can be no stronger against a joint opponent than their weakest sector. Interestingly, China is not one of those countries that resists the imperative of developing a joint operational capability. It has been making serious strides in transforming the PLA from an Army-dominated defensive force to a Navy and Air Force-led joint force on its eastern, maritime borders. 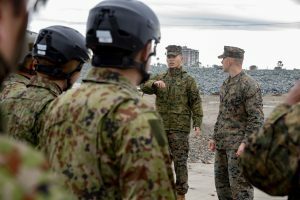 Unless Japan makes the decision to embrace joint operations, it will face an opponent not only with superior resources, but also with superior warfighting doctrine and capability. If there is any military operation that must be joint to be effective, it is an amphibious assault. There must be one commander who controls the naval and air forces to win air and maritime superiority before the landing force can launch, the same commander must direct the amphibious ground force that makes the landing and consolidates the beachhead, and the air and naval fires that support the ground forces once ashore. History is littered with stories of defeats caused by divided command of these complex operations, in which naval, army and air commanders failed to integrate their actions. Unified command is essential. The two joint task forces recommended above are tactical commands to deal with specific current threats and contingencies. There is a larger question of joint organization that Japan should have addressed in the 2018 NDPG. Press reports indicate that Japan is actually taking action to establish joint capabilities and organizations faster and with greater urgency than the vague language of the National Defense Program Guidelines. Perhaps the NDPG are written in such a tentative manner to avoid political controversy. However vagueness carries its own risks: Officers within the self-defense services will continue to resist the establishment of joint commands, with the perceived loss of service prerogatives; the Japanese public will not be prepared for joint operations when the need becomes even more glaringly obvious; most dangerous of all, Japan’s potential enemies will be overconfident that they can take advantage of Japan’s weak joint structure to conduct quick and successful aggression against Japanese territory and interests. Prime Minister Abe has made historically important steps to improve the effectiveness of Japan’s self-defense forces, but establishing a joint operating structure remains unfinished business.